It seems like cauliflower can do anything these days. It has become the new kale of trendy vegetables. It can be anything from pizza crust or tater tots, to rice and Alfredo sauce! I have tried several dairy-free cheese sauces over the years and have never really loved them. They always end up tasting too much like cashews or nutritional yeast to me. This sauce, however, blew me away with the first bite! My dairy-eating husband couldn’t believe how delicious it was either. 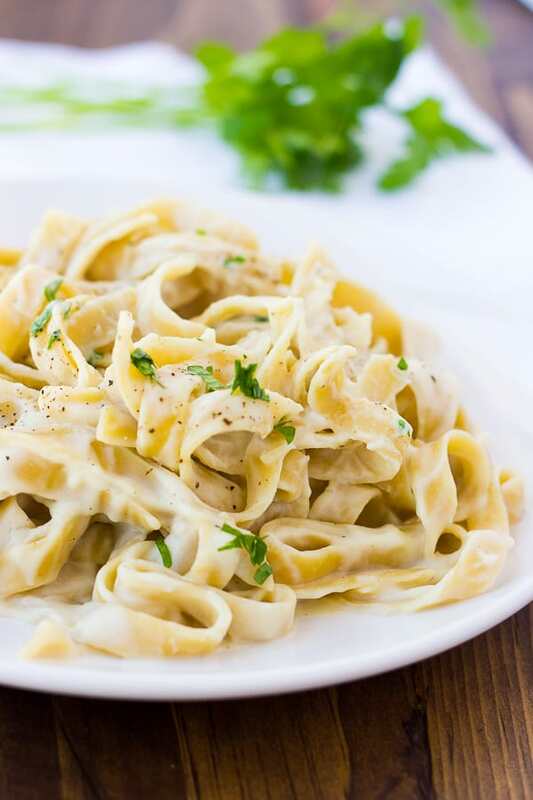 It is smooth, flavorful, and creamy just like you’d expect from alfredo sauce. 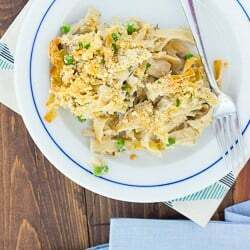 I like serving it with my favorite gluten-free noodles and tossing it with sliced grilled chicken and sauteed broccoli and mushrooms. This sauce also makes a great mac and cheese stand-in for kids. You can serve it with any pasta you like! It would also be delicious for dipping these gluten-free breadsticks. I used to assume that because cauliflower is white, it isn’t as healthy as other vegetables. But that couldn’t be further from the truth! Cauliflower is in the cruciferous vegetable family along with cabbage, brussel sprouts, broccoli, and kale (and more). Cruciferous vegetable are just about the healthiest thing you can eat. They are full of phytochemicals and antioxidants that prevent cancer, lower inflammation, and can even alter gene expression. 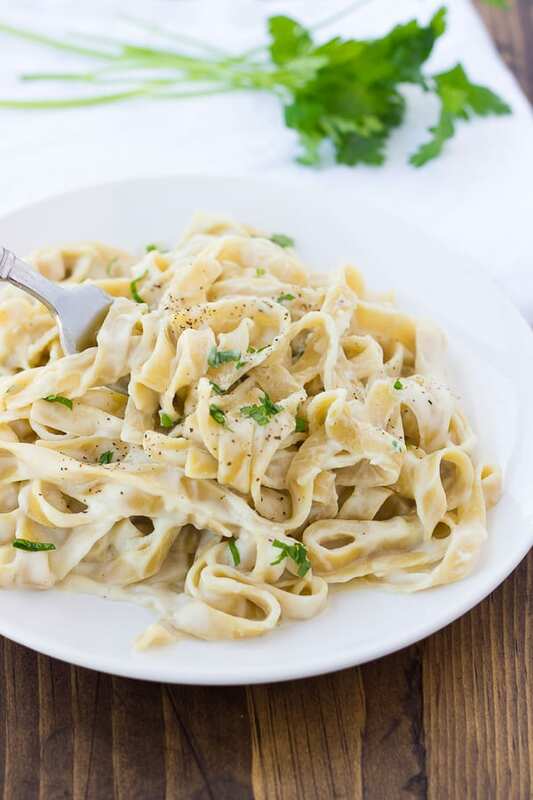 Aside for a healthy serving of cauliflower, the main reason I’m crazy about this sauce is because I finally feel like I’m eating real fettuccine Alfredo again! This sauce freezes very well. I like to double the recipe and freeze half for a quick meal later. I’ve also become a fan of freezing sauces and soups in individual sizes in a silicone muffin pan. After the sauce is frozen, just pop the rounds into a freezer bag. Then you can defrost the amount you need and toss it with a single serving of pasta. Who needs Easy-Mac! This is recipe is designed to be adapted to your allergy needs. If you have no food allergies and just want a delicious cauliflower sauce, use milk and the Parmesan cheese. I personally can eat butter and small amounts of hard cheese, so I use those along with the cashew cream. This recipe also tastes fabulous with olive oil and no Parmesan cheese. The soy sauce may seem like an unusual ingredient, but it adds a delicious savoriness to to sauce! In a medium saucepan or dutch oven, heat the butter or olive oil over medium-high heat. Add the shallots and mushrooms and cook until softened, 5-7 minutes. Add the garlic and cook for 30 seconds. Add the cauliflower and chicken stock. Bring the liquid to a boil, reduce to a simmer then cover. Cook covered for 10-15 minutes, until the cauliflower is very soft. Drain and rinse the cashews. Place them in a high-speed blender with 1/2 cup of chicken stock. Blend (I use the whole juice setting) until completely smooth. When the cauliflower is cooked, pour the mixture into the blender. Carefully blend on low until the mixture is totally smooth. Pour back into the pan and add the soy sauce and Parmesan cheese, if using. Season to taste with more salt if needed and plenty of freshly cracked pepper. Serve with your favorite gluten-free pasta. *I like serving this with Jovial Foods Gluten-Free Egg Noodle Pasta. I often add sauteed broccoli, mushrooms, and grilled chicken. *You can double the sauce and freeze half for later. It reheats very well. This sounds delicious! If I use the 1/2 cup milk, do I still use the cashews? Can those be substituted with all milk? Hi Vicky! Thanks for clarifying. If you use regular milk you can omit the cashews and 1/2 cup broth for blending the cashews. I hope you like it! I just love the versatility of cauliflower too.. but never have I made a dairy free pasta sauce out of it before! This is definitely something delicious I need to try.. it look so creamy! I have made Alfredo Cauliflower sauce, but not with cahews. I love the taste od the sauce, way more healthy than normal Alfredo sauce. This looks amazing and I’m definitely going to try it asap!! Just one note though, if you’re using soy sauce it’s not gluten free. Try tamari sauce instead which IS gluten free. Sounds so delicious! Glad it worked for you! I tried this recipe last night and it was amazing! I can’t wait to make it again. 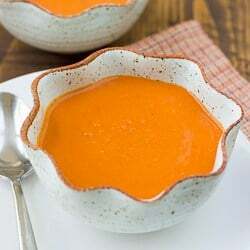 How do you freeze the sauce? Is it once you combine it with the pasta? Do you freeze it as ice cubes, baggie or something like a tupperware container? How long will it keep? I freeze it in ice cubes or baby food molds. Then I transfer the cubes to a ziploc. It should keep for up to 6 weeks! The texture of this sauce was great. My head of cauliflower was large so I used a little more of most of the other ingredients, and added a little dry white wine, mock (dairy-free) parmesan and white pepper. I love the idea of adding a little bacon for extra flavor and will try that next time. Thank you so much for this recipe! It adds some variety to my gluten free/dairy free diet, which I really needed. I have tried a few of your recipes this past year while re-learning baking and cooking with gluten free flour. 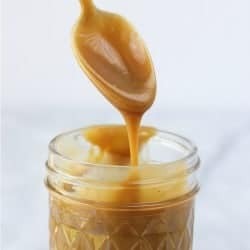 About this recipe, I wondered if it would be okay to use almond milk for the sauce? Almond milk can have kind of an off flavor in this so I don’t like it as much! You could just leave out the milk component altogether if you like!